The Feast of the Conception of God the Daughter falls on the 10th of Astraea (Dec. 8th), just over two weeks before Nativity. Because this is not a human or biological pregnancy but a supernatural conception, it is celebrated, just as it is described in the Scripture, only shortly before the birth. 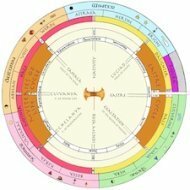 As with all Daughter Festivals, the Event it “celebrates” is, on one level, actually taking place on its Festival Day, since the temporal year is the Supernal Year in reflection. While Nativity begins the Daughter half of the year, the Feast of the Conception is the last Mother Festival and also anticipates the first Daughter Festival. 3. And She stood in contemplation upon the waters of the first darkness; like a great Dove upon the waters She brooded. 4. And She became absorbed within Her and communed with Her own Self; and Her light ceased to shine forth from Her, and yet Her light grew greater. 5. And She fell to Her knees. And the surface of the waters became turbulent, and the great waves curled over Her, and their white foam could not be seen in all that darkness. 6. And when the waters became calm again, the Mistress of All Things rose to Her feet. 7. for She had conceived a Daughter that was not separate from Her, but one with Her, and the Child of Her Light. The return of the Scriptural narrative to the Waters of the First Creation underscores the cosmic significance of the Birth of the Daughter, and the fact that She comes to "save the world" quite literally – not only the beings in manifestation, but cosmic manifestation (the created universe) itself. Just as God the Mother is the Creatrix of the World, so God the Daughter is its Preserver, keeping it in being as Lunar Mediatrix even after it has fallen from the Solar glory of the Mother. Thus the Act of Conception is, in a certain sense the secondary Act of Creation: the one needed to sustain the fallen cosmos in being (while the Dark Mother is She who will in-breathe the cosmos at the end of time). Some other thealogical implications of this passage and of the Conception are discussed on this page. The Feast of the Conception marks the second and longer part of the Advent, and is often seen as the start of the true preparation for Nativity. 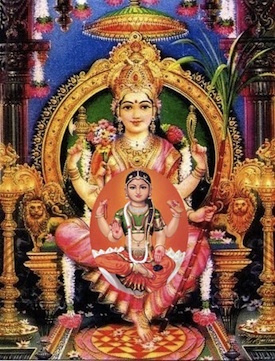 The image at the head of this column shows the Mother as Sai Lalita with the Holy Daughter Sai Bala enclosed mandala-like within her, symbolic of Her supernatural conception.